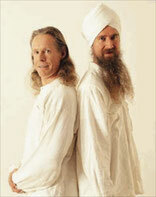 Guru Dharam and Darryl O'Keeffe founded the International School of Kundalini Yoga in the UK in 1996 teaching people to become yoga teachers. They lead trainings in Sweden, UK, Ireland, Israel, New York, Malaysia, Spain, Mexico, USA, Netherlands and Germany. Guru Dharam and Darryl have an international Healing and Yoga practice, and have been teaching Kundalini Yoga for over 30 years. Andrea has been practicing yoga since 2004. Trained as a Kundalini Yoga Teacher with i-SKY in the UK. Together with her teachers Guru Dharam Singh and Darryl O'Keeffe, she started SKY- Cologne. She is a qualified Associate Teacher Trainer for Level 1, spreading her love for music, manta and the teaching in her unique humorous and down to earth way. 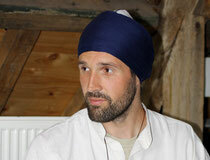 Benjahmin is qualified as Associate Teacher Trainer with I-SKY UK, Kundalini Yoga Therapist and a Shakti Dance Teacher. With his love of the Shabd Guru, music and singing, he brings a devotional and poignant energy to his sharing of the Sacred Science that is Kundalini Yoga.